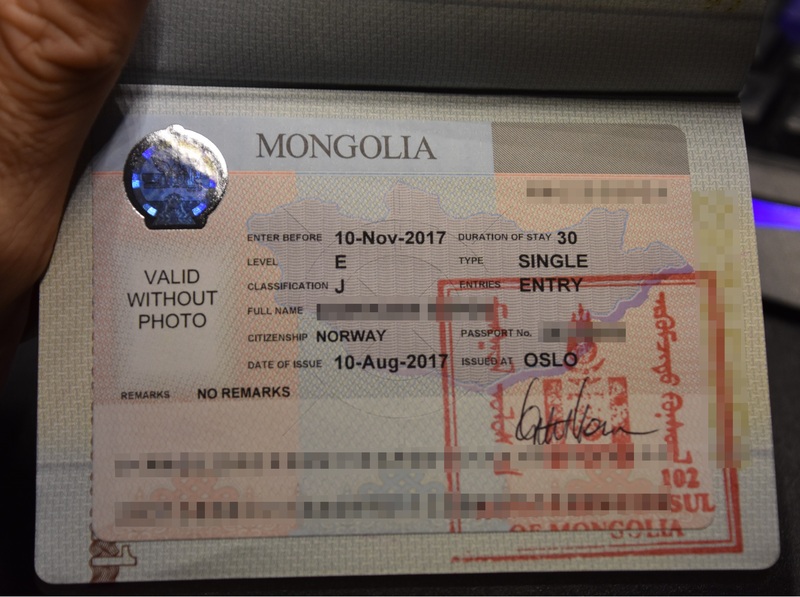 Obtaining visas for our Trans-Mongolian railway trip – a painless experience! We’ve all heard stories about people having bad experiences when applying for visas at certain embassies or consulates. In our case of applying for visas for Russia, Mongolia and China for our Trans-Mongolian railway adventure, we were impressed by how painless it actually was when we did some reading beforehand. These are my experiences with applying for visas in Oslo. After suddenly realizing our departure date was approaching and that we hadn’t yet gotten visas, we went to the Mongolian consulate in Oslo to apply for our first visa. 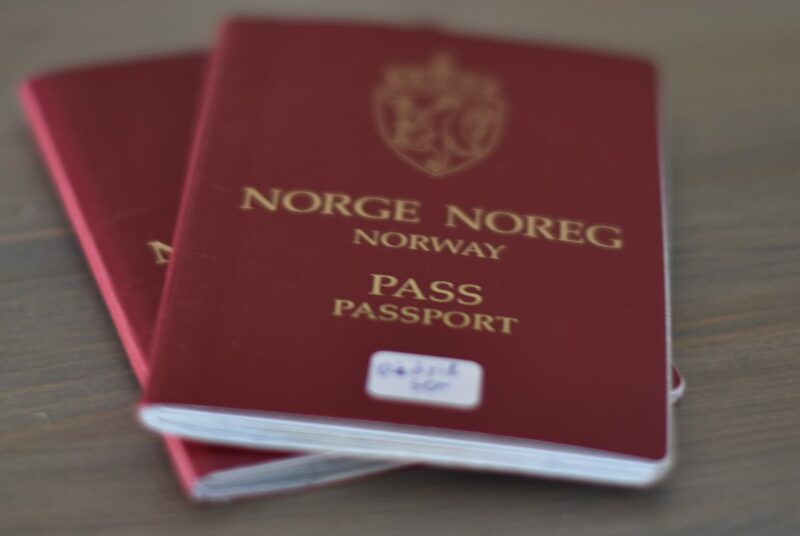 The visa issuing part of the consulate is represented by consul Kjetil Krane at the travel agency KinaReiser AS in Hegdehaugsveien 10. We struggled a bit to find it immediately, since Google Maps claims that number 10 is located about 200 meters from where it actually is (it’s about 100 meters south-east of the restaurant Lorry). This was 20 days before starting our trip, so we didn’t really have too much slack time between obtaining all three visas and the start of the trip. Since the consulate’s official information said that visa applications could take up to a week to process and that they did not issue express visas, we were prepared to come pick up the passports next Thursday or Friday. We walked into the premises of KinaReiser and the room was empty, except for the consul sitting behind a desk doing some work on his computer. «Hello! We would like to apply for a visa for Mongolia». «Oh no, I’m afraid I can’t do that. Try knocking first. Just kidding! When are you going? Let me see your applications». «We’re starting our trip August 30th». «Ah, so you’re not in a hurry, then». «Well… we kind of need three visas by then, to Mongolia, Russia and China». After he looked through our applications, we paid the fee of 835 NOK each in cash, as they didn’t have a payment terminal for accepting cards. The alternative was prepaying to a bank account before applying, but we didn’t really have time for that. At his request, we walked around for a few minutes, just reading some brochures and talking to each other, while he entered our application data into his computer. Mongolian visa granted on the spot! He handed us our passports with the visas stickers applied. We got visas on the spot! We thanked him, and we talked for a little while. He told us that he had traveled with the Trans-Siberian Railway several times himself, and that he’d been about 50 times in China. He told us some stories and gave us some advice for what to bring and what to see. He had even done Moscow – Vladivostok with the very expensive Golden Eagle luxury train (about 11 000 Euros, according to a quick Google search). Ah, perhaps one day we’ll be able to do the same! The fact that we applied for visas in August means that there are far less other people applying, especially compared to June and July. I believe the personality of the consul also played a big role in the very swift application processing. He was exceptionally nice and helpful, a relaxed and obviously well traveled guy. Before applying for the Mongolian visa, we checked the website of one of the companies that help you fill out and deliver visa applications for you for a fee, in order to determine what the exact requirements were. Passport with at least two blank, adjacent pages. Must be valid for six months from the date of applying for a visa, and the passport should not be damaged. A filled out visa application form, available at the consulate’s web page. Visa photo. They have several specific requirements for this photo, e.g. it must be printed on photo paper, white background, no clothing covering the head, etc. The printed photo must be 30mm (wide) x 40mm (high). To be sure we met all the requirements, we had the photos taken at photo store, for about 250 NOK per person. For this price, we got four 35mm x 45mm and four 30mm x 40mm photos each. Since we got our Mongolian visas on the spot yesterday, we were now ready to apply for visas at the Chinese consular at Holmenveien 5. The reason why we didn’t apply for Russian visas first was that we hadn’t yet gotten an invitation letter from the hotel we booked in Moscow. 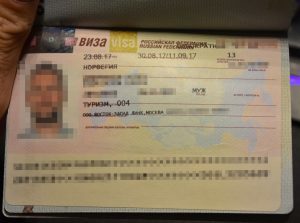 An invitation letter from a Russian hotel, travel agency or citizen is required in order to apply for visas, a practice still remaining from the old days of Russian tourism. The Mongolian consul told us that it was a good idea to arrive at the Chinese consular early in the morning to be one of the first in line when the doors opened at 09:00. He had of course been there to apply for visas many times before, and had ended up behind a guy from one of the companies that help people apply for visas, and that guy had a very large stack of passports and applications. That could take some time to process. We arrived about 08:35, and were the first in line. While waiting, we talked a bit with a lady who was also in line. We told her that we were doing the Trans-Mongolian railway, and that we needed to go apply for a Russian visa as well. She told us that she actually worked at the Russian visa center, and welcomed us there. She said that it’s probably a good idea to pay the extra fee for an express visa to be sure we got it in time, which by this point was our plan exactly. When they opened the exterior door of the Chinese consulate, there was a guy waiting just outside the interior door, meaning that we weren’t first in line after all. He told us that he was following the official recommendations of the consulate, applying one month before the trip. Probably a good idea just to be sure. Approaching 09:00, people started filling the staircase outside the door to the consulate, with probably about 25 people waiting in line. We were thankful for the Mongolian consul’s advice about showing up early. When they opened the door, the guy before us walked up and presented his documents. It turned out that he forgot to bring a copy of the information page of his passport, which is one of their requirements for applying for a visa. He had to leave to get a copy, as they didn’t seem to be able to do that for him. He went from being first in line to the last. I presented my documents, and the lady behind the glass was polite and VERY efficient. She quickly identified that my name was not listed on the hotel booking confirmation, which was made in my fiancé’s name. I told her that I was travelling with her, and pointed her out behind me. The lady politely waved her forward, and my fiancé presented her documents. She looked through all the documents with an efficiency I have never seen before in someone inspecting papers, and every one of our documents were fine. We got a receipt for picking up the passports next Wednesday, meaning a total of four business days, just like they wrote on their official web page. That’s predictability! As the guy in front of us experienced, everything needed to apply for a visa doesn’t seem to be written on their web page. Again reading the websites of one of the companies helping people apply for a visa, we identified a few requirements. A filled out visa application form, available at the embassy’s web page. Visa photo. They have several specific requirements for this photo, e.g. it must be printed on photo paper, white background, no clothing covering the head, etc. The printed photo must be 33mm (wide) x 48mm (high). We just used a 35mm x 45mm photo, and they accepted it. To be sure we met all the requirements, we had the photos taken at photo store, for about 250 NOK per person. For this price, we got four 35mm x 45mm and four 30mm x 40mm photos. Copy of the information page of the passport. Tickets in and out of China. In this case, a train ticket confirmation from Ulan Bator to Beijing (confirmation provided by the travel company Real Russia) was enough, in addition to a plane ticket from Beijing to Oslo. Confirmed hotel booking, showing the name of the applicant. 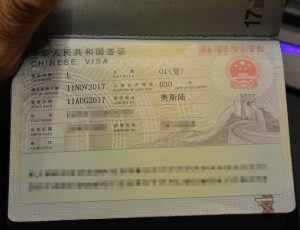 Since it showed my fiancé’s name, I wrote a comment on section 3.7 («If you have more information about your visa application other than the above to declare, please give details below or type on a separate paper»), saying that the name on the hotel booking was my fiancé’s, and that I was travelling with her. They accepted it. Today was the day we were scheduled to pick up our passports at the Chinese consulate. We (or in fact, just myself) had a scheduled appointment at the Russian visa office (IFS Norway) later that day, at 10:20. Because of this appointment, we were at the Chinese consulate by 08:30 to be the first in line to pick up our passports. Just like last time, they opened the outer door approximately 08:45, and people started filling the staircase when approaching 09:00. We were the first in line, so paying and picking up the passports was a quick event. Notice that we paid the fee when picking up the passports, not when applying for a visa. The price was 600 NOK per visa. If you don’t get a visa, they don’t charge anything. We probably wouldn’t have had to wait very long even if we hadn’t shown up early, as there is one queue for applying for visas, and one queue for picking up visas. Visas granted, hooray! Chinese visa, a beautiful piece of sticker! We went to the Russian visa center at Grev Wedels Plass 4, right next to Akershus Fortress. At the time of arrival, we were the only ones there. Before going, we were a bit nervous that my fiancé would have to wait for hours since she didn’t have an appointment. She didn’t have an appointment because there was only one spot left when we checked, and I booked that one. They clearly state on their website that one appointment is for one person only, and that those without an appointment have to wait in line until a booth is available. The woman in the booth welcomed us with a friendly smile, and my fiancé presented her documents. She looked through the documents, and everything seemed fine except one thing: The invitation letter mentioned that the trip was along the Trans Siberian railway and that it was supposed to happen according to a specified itinerary. Since we did not have a specified itinerary attached, this could be a little bit problematic, she said. To be sure, she recommended one of two things: Obtain a new invitation letter where the cities we planned to visit were listed instead of just “Trans Siberian”, or write a itinerary ourselves and print it. She recommended the first. As mentioned earlier, we had requested an invitation letter from the hotel we were staying at in Moscow. Since they never answered our request, we asked Real Russia instead. Real Russia is a travel agency that provide various services, but we used them to book our international train tickets, i.e. Irkutsk – Ulan Bator and Ulan Bator – Beijing, because we couldn’t book international tickets ourselves on rzd.ru. We used rzd.ru for booking all of the tickets for the railway journey within Russia. Although the tickets booked with Real Russia have a 25 % markup in price, they have among the best customer service I have ever experienced. They’ve answered all emails very quickly and done everything they could to satisfy us when we had to change the date on one of our bookings. We received our tickets within 24 hours by DHL from Moscow to Oslo. Not bad! We went back to our car and mailed Real Russia about the need for a new invitation letter, hoping that they would respond as quickly as previously. They did, and within 40 minutes, we had a new invitation letter where they had specified the cities we were visiting and a hotel in each city. We went back to the visa office and asked if they could print it for us. Sure, no problem. I just forwarded the email with the invitation letter, and she printed it for us. Unlike at the Chinese consulate where I paid when picking up the visas, I paid when applying at the Russian visa center. The price was 615 NOK for each visa. Going in, we planned to pay a little bit extra for an express visa, but this wasn’t necessary as we could pick up the passports one week later, Wednesday 23rd, one week before flying to Moscow. Before applying, we again did some reading online about what’s needed for applying. An appointment at the visa center, IFS Norway. It is possible to apply without an appointment, but you could potentially have to wait a while in line. Visa photo. They have several specific requirements for this photo, e.g. it must be printed on photo paper, white background, no clothing covering the head, etc. The printed photo must be 35mm x 45mm. To be sure we met all the requirements, we had the photos taken at photo store, for about 250 NOK per person. For this price, we got four 35mm x 45mm and four 30mm x 40mm photos. Copy of a valid travel insurance policy, showing the name of the applicant and the policy number. To be sure, we got them stamped and signed by representatives from our respective insurance companies, with all details written in English. Invitation letter from a hotel or travel agency. We tried contacting the hotel we had booked in Moscow, but they did not reply. We therefore contacted Real Russia, and they provided invitation letters free of charge as we had used them to book some of our tickets. (Confirmed hotel booking). We brought this, but it turned out to be unnecessary. They didn’t need it. One thing worth noting: You don’t need to apply in person as I’ve seen some blog posts claiming. This is perhaps obvious since there are companies that deliver the visa applications for you, but I’ve read somewhere recently that they supposedly were strict about it, and that you’d need a good excuse not to apply in person. The woman in the booth at the visa center confirmed to me that you can in fact deliver a visa application for someone else without issues and without a reason. The final visa needed for our trip! 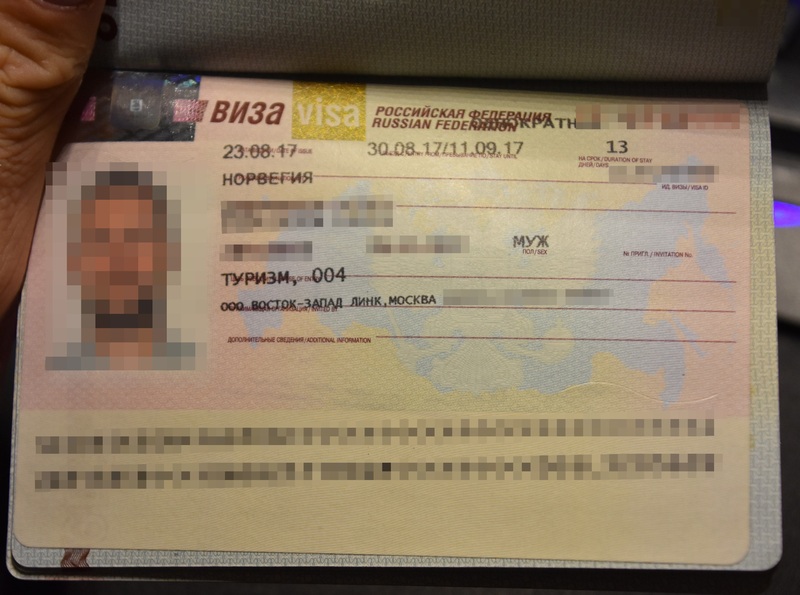 Today was the day of collecting the last visa; the visa for Russia. One week left until departing for Moscow. The instructions said that the passports were ready to be picked up after 12:00, and that you didn’t need to make an appointment. Arriving at about 13:30, there were just a few people waiting in line in front of me, so I got help pretty quickly. I presented the receipt I got when we applied for the visa a week earlier, and got both of our passports in return. This confirms that you could also pick up someone else’s passport without issue, as long as you have the receipt. All visas granted, and we were now ready for our Trans-Mongolian adventure!